Rev. Penny Slinger Hills is an ordained Minister of the Goddess Temple, an auxiliary church of the Universal Church of the Master. The Goddess Temple is the perfect place to celebrate and sanctify the sacred union of marriage. You can have your ceremony of choice at the Temple. 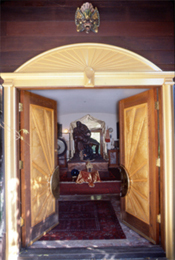 Reverend Penny Slinger Hills offers Goddess and Tantric wedding ceremonies and blessings. Dr Christopher Hills and Penny Slinger were married on the deck of the Goddess Temple. The natural beauty of the setting and the spiritual intention that has been woven into this land and the creation of the Goddess Temple make it a unique location for your sacred marriage. There are a wide range of outdoor locations and shrines to choose from on the property. E-mail us at info@goddesstemple.org if you would like to know more about the Goddess Temple for your Wedding or special event.